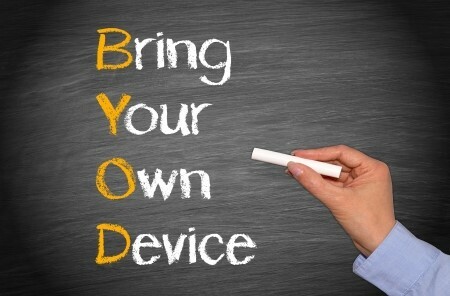 It wasn’t too long ago that companies never had to think much about their BYOD (Bring Your Own Device) strategy. The BYOD strategy that businesses employed was giving their people what they thought they needed and then taking it back when the time came. If they got to a point where the data had to be wiped, they would take the phone or laptop, wipe it clean, and then give it back. BYOD has changed the landscape, and your IT support partner in Houston needs to be caught up with the latest and greatest industry developments. Things have come a long way even in the last decade as it pertains to what’s allowed to connect to a company’s network. The lines are very blurred when it comes to what’s professional and what’s personal information. It’s now employees that want to connect their tablets, smartphones, and laptops all to the company network. They’re bringing their own devices, but want to be able to stay productive on them in both a personal and professional setting. How do you differentiate personal and vocational information and make sure everything is secured? Safety is at the head of the BYOD game, and it’s up to IT support experts in Houston to figure out how to best deal with it. Think about all the risks that exist when you have external devices hooking up to your company network. Companies invest a lot of money into information technology security. They’ll think long and hard about things such as firewalls, virus, and malware detection software, among other things. In the past, the only fear was that someone would be able to hop on a company laptop or phone and find a way to get at sensitive data through there. Now, you have all these BYOD users that are also connecting to the network. Instead of the one door through your firewall from the devices that you give out to your employees, you’re opening thousands of doors. Every mobile device that’s connected to your network provides a gateway in. It’s up to the security that’s built to make sure that none of them access sensitive data and allow it to be placed in the wrong hands. There’s a scene change that has already come and is continuing to arrive as part of the BYOD phenomenon. Managed service providers need to stay on the forefront of this by pushing the types of security protocols that are designed for ultimate protection into place. As the cloud continues to expand and gain in popularity, this is only going to be amplified further. You’ll have users on foreign devices getting your data on a cloud server that you may not have as much control over. The changing landscape makes security more important than ever. The IT support provider in Houston that you hire is very important. To hire someone that understand what BYOD is all about and the significant risks that it presents, reach out to us at HoustonTech today.